Zombie shows and movies are quite popular among adults and now they have entered popularity among the younger population as well. In fact, at my daughter’s school, they did a social studies lesson with a zombie theme and the kids loved it. This picture book for the youngest readers encourages a love of reading with a silly theme, a zombie who eats books. 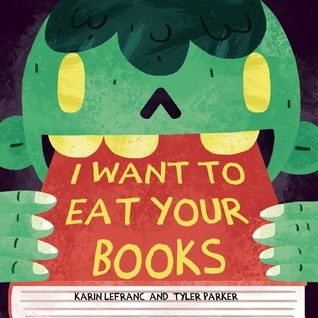 A new student, a zombie, his fellow classmates a little unsure of their safety until they realize that all he wants to gobble up are their books. He doesn’t care what genre it is or its size, he just keeps gobbling through the books, eating them one by one. 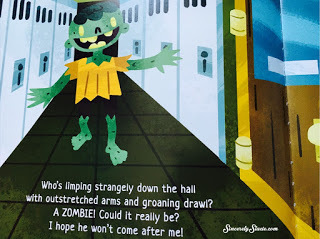 Then the whole class gets to go to the library and the zombie is in book-chomping heaven….until he spies one book. Will that book change his diet and turn him into a book READER rather than a book EATER? Lefranc uses a rhyming scheme to tell this silly story and does it quite well. The words flow easily as a reader and none of them appear as a stretch to make the rhyme work. Parker’s illustrations are vivid and large, filling the entire page. If I were still doing storytime at our library, this would make a great book to read out loud to the kids with plenty of opportunities for expression in your reading. This is one I’ll be keeping in my substitute bag to read when I am in the lower elementary classes. 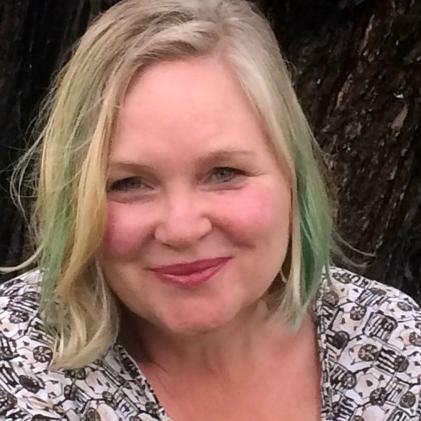 Karin Lefranc grew up all over the world, living in Sweden, South Africa, and the United Kingdom, but she moved to the United States to attend Bard College in New York. She now lives in Connecticut with her three girls and one boy, all who love devouring books in all shapes and sizes. This is Karin’s debut picture book. For more on Karin, check out her website, HERE. You can also find her on Facebook, HERE and Twitter, HERE. 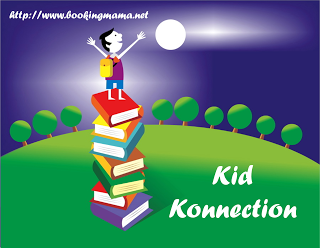 I will be linking up this review on Booking Mama’s Kid Konnection. Every Saturday, other bloggers share their links to children’s and YA book related posts. Oh, my boys would LOVE that book! This book sounds really fun! I just reserved it from the library for my 5.5 y/o. Thanks! I'll definitely check out the Kid Konnection link up too. I post a lot of Kid Lit reviews. That looks adorable. I'm sure most kids would love the zombie theme! Love the concept behind this book! Too cute! Wonder what book made him reconsider?